Joint injuries/surgeries – luxating patella, ACL tears, hip dysplasia, elbow dysplasia, etc. Neurologic injuries/surgeries – disc rupture, FCE, Wobbler’s disease, etc. Therapeutic exercises – These are similar to exercises performed in human physical therapy, and designed to focus on a specific problem. Exercises are a very important aspect of the rehabilitation program and include specific motions to improve joint health, range of motion, flexibility, balance, and strength. 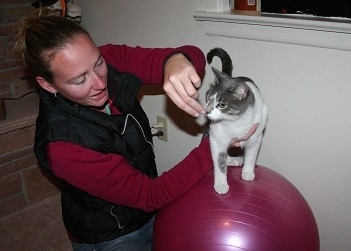 These exercises are designed to begin very gently and evolve as your animal progresses. 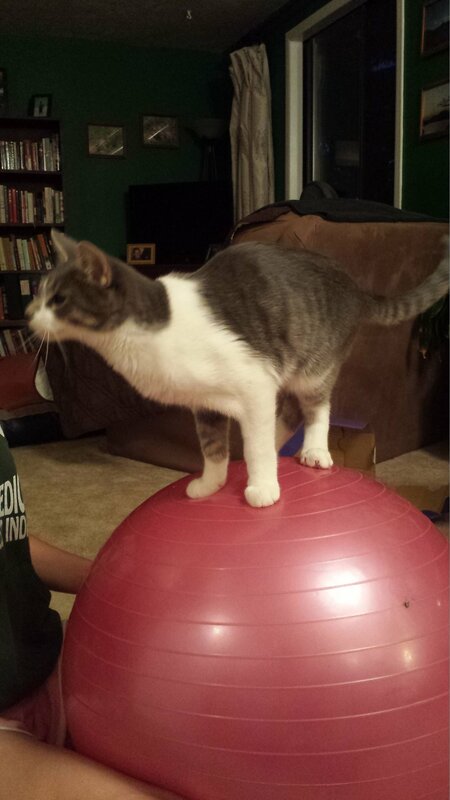 Balance and strengthening exercise after hip surgery. Neuromuscular electrical stimulation – NMES involves applying an external electrical current over a motor nerve to stimulate a muscle contraction. This is useful for animals who are unable or unwilling to exercise, and can also be used for relieving mild to moderate pain. This can be particularly useful for paralyzed or weak animals, or those recovering from surgery who must be exercise restricted. Acupuncture – Acupuncture is most commonly used for pain management, but can also be useful for many other issues. It has been shown to improve neurologic function and can be especially effective in treating intervertebral disc disease in dogs. It can also be used as adjunct treatment for various other internal medicine issues such as nausea, anorexia, etc. and is often used to help treat side effects associated with chemotherapy and other medications. Laser therapy – “Low level laser” or “cold laser” is most often used to decrease pain, swelling, and inflammation. It can be particularly useful in the post-operative and arthritic patient, but is also useful for improving healing times for muscle and tendon injuries and for large or slow-healing wounds. Laser therapy is quick, non-painful and non-invasive. Massage therapy – Massage has many beneficial effects including improved blood flow, flexibility, and nutrition to the areas being worked on. This can be useful from a pain management standpoint, particularly for compensatory muscle tension close to and as a result of an injury or surgery. Herbal and Nutritional Consults – Herbs and food were the original “drugs” and have been used for thousands of years for treating a variety of conditions. These can be effective treatments for many conditions and often work best as part of an integrated approach. 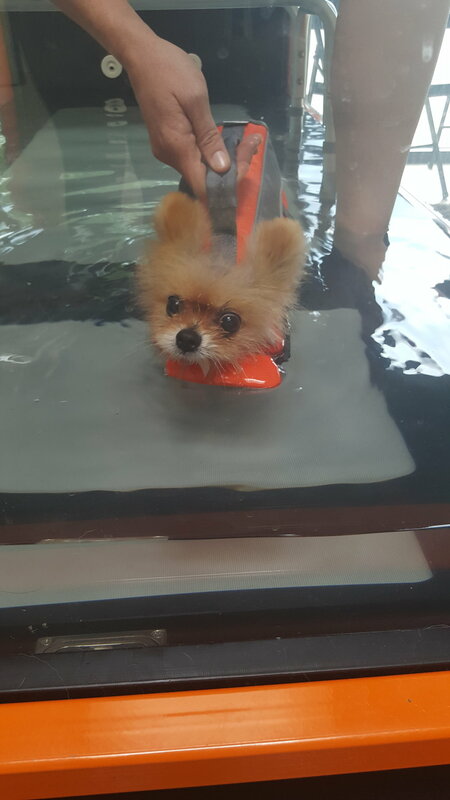 Hydrotherapy/Underwater Treadmill – The buoyancy of water assists in providing low impact exercise, which is especially important for animals recovering from injuries, or animals with painful joints. The small amount of pressure on the body provided by the heated water can also be a very useful tool for reducing joint and muscle pain. Additionally, the water provides a means for resistance training which is an important aspect of strengthening muscles, whether the patient is a conditioned athlete or a geriatric animal with decreased mobility. Our machine has many options, including jets, incline, variable speeds, and variable water height, allowing us to customize the treatment to the specific needs of each of our patients. Call us with questions or to set up an appointment. Or, send us an appointment request.